As the title suggests, this is the sixteenth installment in the Stephanie Plum series. And I have to say, sadly, the old girl is starting to show her age. When I first started reading this series, I absolutely loved it, and I could not wait for every new book to come out. But after so many books, I still love Stephanie, but she hasn't really developed much the last several books and it felt a bit like the author was clutching at straws. Bad Luck: Vinnie, of Vincent Plum Bail Bonds, has run up a gambling debt of $786,000 with mobster Bobby Sunflower and is being held until the cash can be produced. Nobody else will pay to get Vinnie back, leaving it up to Stephanie, office manager Connie, and file clerk Lula to raise the money if they want to save their jobs. Good Luck: Between a bonds office yard sale that has the entire Burg turning out, Mooner's Hobbit-Con charity event, and Uncle Pip's mysterious lucky bottle, they just might raise enough money to save the business, and Vinnie, from ruin. Bad Luck: Saving Vincent Plum Bail Bonds means Stephanie can keep being a bounty hunter. In Trenton, this involves hunting down a man wanted for polygamy, a Turnpike toilet paper bandit, and a drug dealer with a pet alligator named Mr.Jingles. Good News: The job of bounty hunter comes with perks in the guise of Trenton's hottest cop, Joe Morelli, and the dark and dangerous security expert Ranger. With any luck at all, Uncle Pip's lucky bottle will have Stephanie getting lucky - the only question is...with whom? 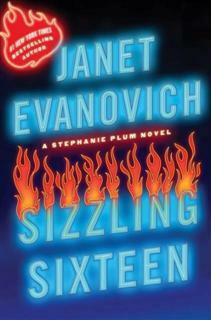 Janet Evanovich seems to have written her way into a corner with her Stephanie-Joe-Ranger love triangle. It's gotten to beyond a joke really, nothing has happened with either of them for a while and I'm pretty over her 'torn' feelings for the two. Just pick one already! I think the problem for Evanovich is either way she is gonna have half her fans disappointed if she picks one man over the other, and also risks losing the romance fans that read the story for exactly that reason, the love triangle. For the record, I'm Team Morelli, but either way I'd still keep reading them...I just might not buy them again. As I said, I still love Stephanie, and this book had a couple of LOL moments, but a few of them just felt like she was trying too hard to top the weird, wacky and wonderful things that have happened in other books. But don't take my word for it. I don't know if it was just the mood I was in when I read it or what, but I didn't enjoy it as much as I have the earlier ones. Interesting. I have read and own all of them up to this point but have been told by a couple of people to not bother buying this one. I think quite a few people have been disappointed. I'm not sure I want to read 16 if case it tarnishes the rest for me. As neither a Ranger or Morelli girl I don'f feel a vested interest in teh outcome but I can see how making the choice will put off side.